Here is a great way to add a closet where there was not one before! Sturdy wood unit is fitted with a linen cover. Front flap rolls down to hide items from view, rolls up and is held in place with velcro tabs. Ample room for an entire wardrobe with hanging space, shelf space on ample sized shelves. Side pockets are great for added storage as well. 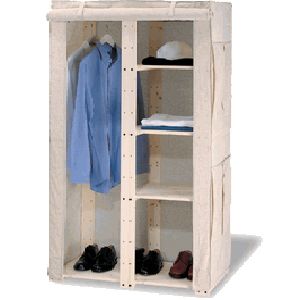 This is great storage unit for sweaters, linens and towels, office items and more! Assembly is required, but this is too easy! All hardware and instructions are included.